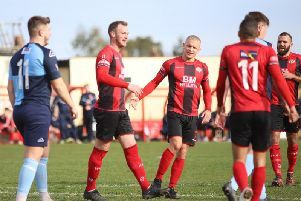 Kettering Town maintained their two-point advantage at the top of the Evo-Stik League South Premier Division Central with a 3-1 success at Alvechurch. The Poppies handed a start to Luke Graham who re-signed for the club on Friday but Gary Stohrer missed out through injury. The Poppies opened the scoring early on when Rhys Hoenes won and then scored a penalty. The hosts got back into things through Danny O’Callaghan but Kettering regained the lead on the stroke of half-time. Declan Towers grabbed his first goal for the club with a fine header from a corner. And the Poppies wrapped things up in the second half when Hoenes was able to tap home his second goal of the afternoon after a mistake from Alvechurch goalkeeper Matt Sargeant. Kettering are back in action on Tuesday night when they head to Banbury United in the first round of the Southern League Challenge Cup.